People have different callings and, when it comes to baking, mine is in tarts and pies. Whether round or square, free-form or shaped, sweet or savory, it’s what I like to make. With the weather favorable to growing stone fruit, irresistible peaches are now in abundance at Seacoast farmers’ markets, farmstands, and pick-your-own farms. My kitchen is full of them in varying stages of ripeness, waiting to be savored plain as an exquisite treat on its own, or turned into a luscious tart. Either way, peaches don’t travel well, making it worth paying attention when they’re available locally. Handle them gently when selecting or picking, as any bruised spots will rot. As one peach farmer admonishes, “It took a full year to grow that peach, show a little respect.” Fortunately, peaches are also one of those fruits that continue to ripen once plucked from the tree; your patience will be rewarded. This recipe for peach tart is slightly tweaked from The Food Maven, who, from his own memories of summer, calls it “beach tart.” It requires little by way of equipment, what I imagine would be found in the kitchen of a beach vacation rental—a pie or tart pan, a peeler, a paring knife—the rest can be done by hand. It comes together quickly, with a crust that needs only to be pressed into place, a relief when the summer humidity makes rolling out the dough a chore. Though recommended, it was too warm to leave the tart out overnight and, even chilled, still made for a fine breakfast indulgence. 1. Heat the oven to 400 degrees. It won’t be on long, and the results will be worth heating the kitchen up. 2. For the crust: In a mixing bowl, stir together the flour, the 1/4 cup of sugar, and salt. Cut in the butter, using the tips of your fingers or two knives, until the mixture resembles coarse sand. Press the mixture evenly into the bottom and up the sides of a deep 9- or 10-inch pie plate or tart pan, until it reaches the top edge. 3. Arrange the peaches over the crust. If using, mix the cinnamon in with the 1/2 cup sugar. 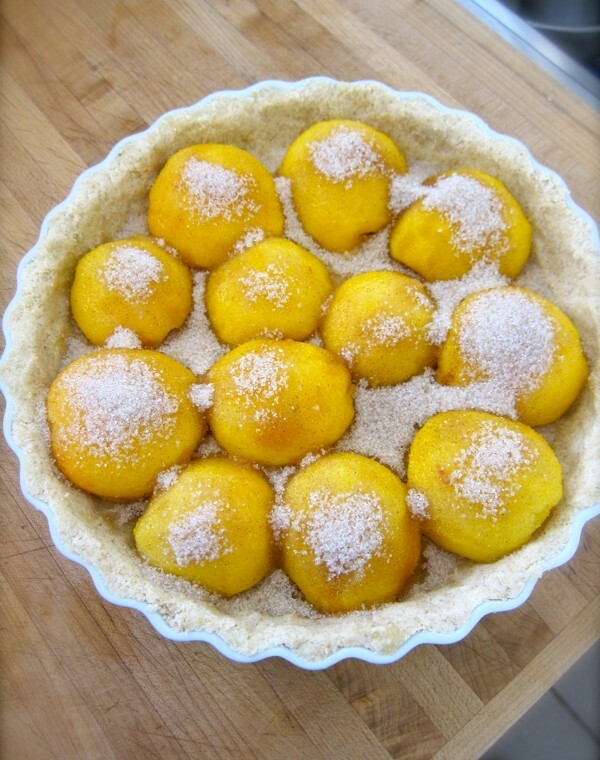 Sprinkle the sugar mix over the peaches (see photo above). Bake for 15 minutes, the juices will start to caramelize with the sugar. 4. Meanwhile, place the cream and eggs in a small bowl. With a fork or small whisk, beat together until well blended. 5. After 15 minutes, remove the tart from the oven. Pour the egg and cream mixture over the peaches, then return the tart to the oven for another 30 minutes or until the filling is set. Remove from oven, and let cool slightly. Serve warm or at room temperature. Note: Vary this recipe by substituting any seasonal stone fruit—nectarines, cherries, or plums are all good choices. In place of the cinnamon, ground ginger is another favorite flavor enhancer that marries well with peaches. Depending on the dairy you use, you may have to increase the amount of sugar in the filling to 3/4 cup in order to balance out any tartness. A teaspoon of vanilla may also be added, but only if it’s to your liking. How Big a Backyard Farm Do You Need?